On Elk Ridge in southeastern Utah, a unique opportunity has arisen. With cooperation between the Forest Service, the Ute Mountain Ute Tribe and the Trust, the 28,000-acre White Mesa Cultural and Conservation Area will be closed to livestock at least through 2022. This is the only allotment on the forest with no livestock grazing. In 2013, the Ute Mountain Ute Tribe agreed to ten more years of rest from livestock. Over the next decade, the Forest Service plans to undertake extensive prescribed burning of ponderosa pine and aspen in order to retain older ponderosa pine, and increase aspen sprouting. During this decade, we will reconstruct and maintain boundary fencing to keep out trespassing cattle. By 2015, we will draft a ten-year research and restoration plan. 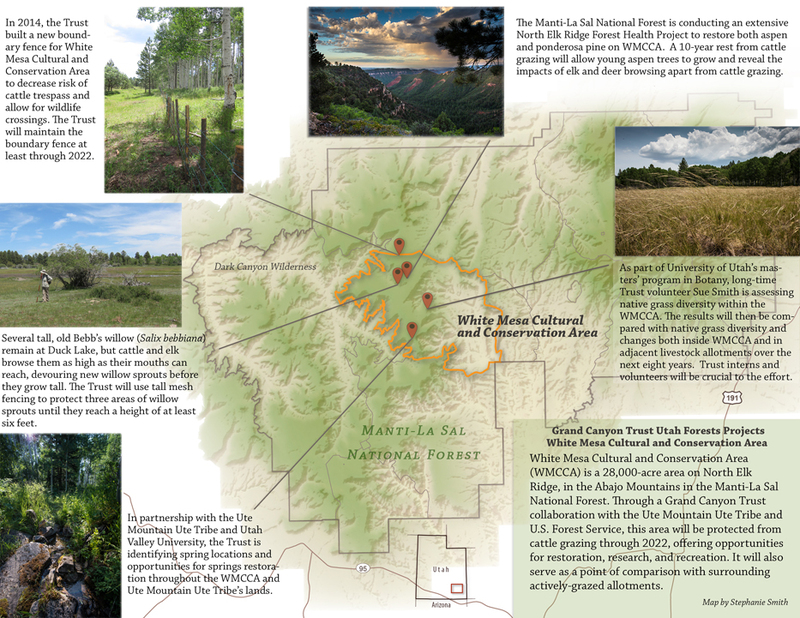 This will include work to restore willow, a plant of special cultural value to the Ute Mountain Ute Tribe. We also have the rare opportunity to use science to learn about wild elk and deer grazing and browsing in these mountains and how their impacts differ from livestock use. With skilled volunteer botanists, we will map the diversity and distribution of native grasses throughout the White Mesa Cultural and Conservation Area and take photographs to help the Forest Service, the Ute Mountain Ute Tribe, and the public see major restoration potential within the surrounding Elk Ridge and Abajo Mountains. Willow are a keystone species at the edges of creeks, ponds, and springs. They provide diverse wildlife niches, anchor river and creek banks during floods, and cool water under their shade. The Trust has made a commitment to the Ute Mountain Ute Tribe to help develop and implement a willow restoration plan for riparian areas. As the only ungrazed allotment within the 1.4 million acre Manti-La Sal National Forest, the area is a crucial source of information about the impacts of livestock on surrounding national forest lands (separate from the impacts of elk and deer) and the potential for recovery of resilience in the midst of climate change.